O.K, you sould have been with your rabbit for a month now. Your rabbit shoukd relize when you need to go to school and when you come back home.This is important, because in the begining your rabbit wouldm't understand why you where leaving and might of got mad at you. Now your rabbit understands that it is O.K. to leave the room for awhile. Also your rabbit should be getting stronger and bigger. Also you and your rabbit should of gone to the vet by now. When you first got your rabbit he/she needed you for the first week or two, now that your rabbit is getting bigger and can go longer without food. In the wild your rabbit would only have 1 or 2 more months until he/she would go off on its own. What I mean by "Own" is that rabbits stay together for ever, but they make thier own part of the Burrow! Ta-Ta for now and if you need anything just go to Contact Us!! Great! Hopefully you have chosen your friend for life! He/she is the one you have been dreaming about for months. Make sure you really do like your rabbit, because rabbits live to their early teens. You probably really want to show your friends or put it outside to run around and dig holes, but I personally think you should slowly introduce your new friend after a week. Make sure your fiends talk in a nice calm voice. Squeaky voices can make a rabbit scared and loud voices mean that him/ her is doing something wrong! After a week don't immediately show everyone, one to two friends a day. When you show your rabbit everything at once, he/ she gets confused who is the owner and who is a visiting friend. When selecting your rabbit you want to make sure you pick the right rabbit. They say that the bigger rabbits are more expensive, but are mostly laid back. Smaller ones can be cheep and are mostly happy and jumpy. The bigger rabbits are like the French Lop and any lop are suppose to be big. I've seen small lops though. The dwarf rabbit thought is so jumpy. This is the kind of rabbit that if you have children and are home most of the time. If you work and want to have a rabbit choose a bigger one! They are laid back so they will just hang back at nighttime when you are exhausted they are there to comfort you. I am not saying they do not have their crazy moments. Please choose wisely! Every Rabbit Sheds. The two times of the year the ALL pets shed is in spring and fall. This is when you have to dig out your brush from your closet. For certain rabbits, they always shed. Shedding can be taken in from two ways. One way: When rabbits have a 'period of back up fur'; this means if you see fur collecting on the floor: you have to brush your bunny. Another way: When your rabbit's hair gets long and tangled. I call this, 'Fuzzy Bunny', basically meaning they are fuzzy and they need a hair cut! When your rabbit sheds, either growing of the hair or collecting of the hair, it is very uncomfortable! When brushing your rabbit either put your rabbit on a table or on a moving object such as a washer machine. I personally like to brush Thumper outside. Her hair flies into the world, and rabbit fur helps the birds build their nest. I brush Chloe on the washer machine. This is because she is scatter footed and scampers a lot! When brushing your rabbit make sure to brush their back, sides, and belly! A lot of fur will come out, but do not worry! Your rabbit will not be bald! When brushing your rabbit, be delicate. You might notice skin problems. Visit www.binkybunny.com to learn how to do a monthly maintenance Please take care of your rabbit! Please contact me if you have ANY questions. Hello and welcome to this week's 'Lesson'. This week I will be discussing how to make sure you have the right 'Rabbit Sitter' when going for a long weekend or for just a short vacation. So this is how to prepare for a week's worth of long vacation. Ask them questions like, "What kinds of pets do you have?" Ask for a permit, if they don't have a permit ask for their lenience. Today, we are going to be talking about exercise outside. Now that it is March it should be getting warm out, unless you live in Alaska. Sometimes during the nice weather you will tend to bring your rabbit outside. If you do this you should first know what to do. 1. Make sure your rabbit has protection! If you do not do this, their eyes might get hurt from the sun, or if they see a predator, then they can hide from them. 2. Never leave your rabbit running around by its self. Your rabbit might eat something that he/she shouldn't and they could easily escape. If you are leaving your rabbit outside for awhile make sure it has the basic needs (hay, food, water, etc.) and that they have a good hutch that not even a raccoon or smart animal can open. 3. Make sure your rabbit has basic needs. This is just encase, your rabbit can't tell you "I'm thirsty!" 4. Never put your rabbit in danger! This can cause serious damage to ANYTHING! So make sure your rabbit is safe and not just wandering. Personally I hate the leashes, but if you can't get a hut, then put your rabbit on that. 5. Make sure your rabbit is conformable! Your don't want a sad bunny. That is all you need to know! If you need more information e-mail me or just go under Contact Me. Thanks. It is important to make sure that you have time for your rabbit and that you can organize your time. You can click on my form and there is a chart that you can fill out and hang on your wall, so you can remember when to let them out and STAY ORGANIZED! The main idea is that you get how to orgainize your time for sports, school, and other life activities, so you can still stay calm and have fun with your rabbit. Also with STAYING ORGAINIZED you should also include when to go shopping in the notes box. This way you can record notes saying things like "Getting Low on pellets" -or- "Need to go shopping Thumper needs more toys to chomp on!" Simple things can make a difference. Don't forget to sign up on THE RABBIT THING'S MALING LIST! I am looking forward to be having some people sign up, so i can get out some e-mails. Thank you and don't forget to leave a comment! Rabbits LOVE to chew. That is a fact,so you should make sure you have PLENTY of toys for him/her. 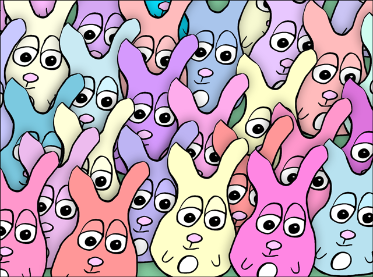 Rabbits also need toys so their teeth get worn down and they do not over grow, since their teeth are ALWAYS growing. Not only that,but you also need to make sure that you have a dig box, or something to provide them something to dig in. Binky Bunny has a big selection of toys you can make, that is rabbit safe. Anyways your rabbit is getting to a teen age too. When your bunny is 6-9 months that is when it is a "Teen". Most bunnies get no attention then, because they scratch you and bite you too! That is O.K. do not punish them for that...they are growing up in you-know-what. When your rabbit hits a age of 1 year that is when it is playful, but at the same time quite and relaxed. If you have ANY questions PLEASE ask me.